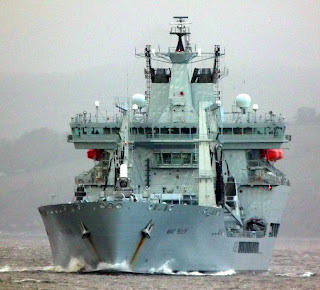 RFA Wave Ruler is a Wave-class fast fleet tanker of the Royal Fleet Auxiliary (RFA) of the United Kingdom tasked with providing fuel, food, fresh water, ammunition and other supplies to Royal Navy vessels around the world. Wave Ruler was built by Kvaerner Govan (after 1999, BAE Systems Marine) and launched in 2001. She was accepted into service in 2003 and is the 2nd ship to bear this name in RFA service.